I still have a little work to do in improving it (check out the snazzy lighting...ugh), but it's such a great and inviting space to work in. Now, about the food (i.e., the mess that's on the counter is actually my mise en place for lasagna making)...I don't think there's really such thing as an awful lasagna. Generally, when you get the combination of tomato sauce, cheese and pasta...it's probably not going to be bad. I mean, it can be kinda bad, if you use those heinous oven ready noodles...but overall, it's hard to go wrong. So, while I definitely recommend this recipe (it was very yummy), I don't know if I can say it's really THAT much better than most of the other recipes out there. One thing I can say, however, is that you should never make just one lasagna. It's one of those dishes where with about 10% more effort, you can have 100% more food. Sounds like a good investment to me! The thing with this particular lasagna is that there is very little chopping involved - an onion, some garlic...that's about it. 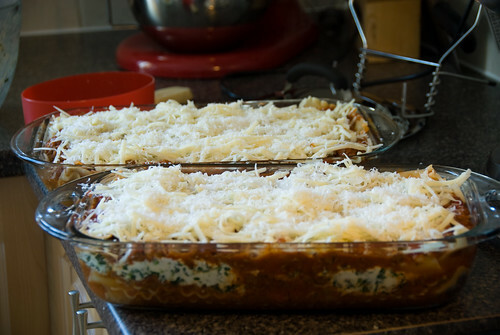 The rest of the effort is really more about just putting it together, and since it's not especially difficult to assemble, you should definitely consider making a second lasagna for your freezer. I still don't like most frozen food, but lasagna is the exception - I find an uncooked lasagna freezes really well (just try to defrost it, if you can, before baking). I'm personally a fan of just defrosting it on the counter, but the bacteria police (who seem to think that bacteria will somehow grow on what is essentially a block of things that are all going to fine at room temp for a couple of hours....) will suggest that you defrost in your fridge. I don't like fridge defrosting...it's SO slow...but do whatever turns yourr crank. This lasagna is yummy. If you make it, you'll like it. 1. Spray a 9x13 pan with cooking spray and set aside. 2. To make the sauce, remove casing from the sausage and break into small pieces in a large deep skillet (my 6 qt sauté pan was able to hold a double batch). 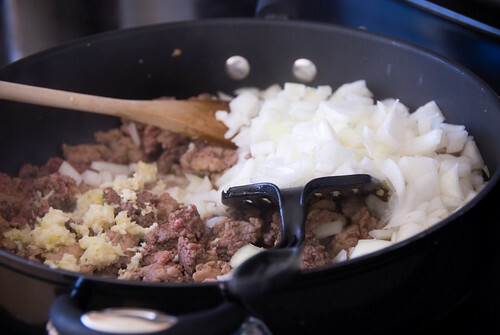 Add ground beef, onion and garlic. Cook over medium heat until the meat is no longer pink. Stir in oregano, red pepper flakes and dried basil. Cook 1 more minute. Add pasta sauce, tomatoes, vinegar and pepper. 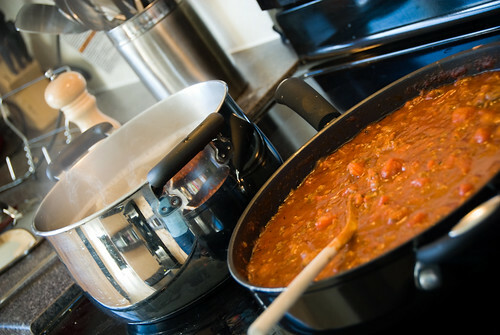 Bring to a boil, and then simmer until you're ready to use it (at least 20 minutes). 3. 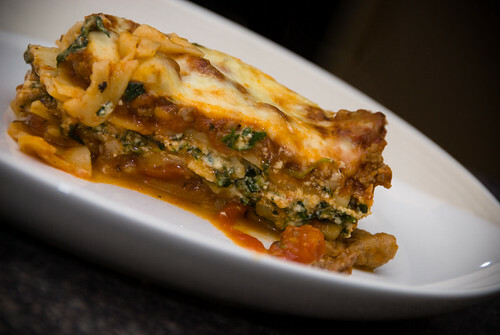 While the sauce is simmering, cook the lasagna noodles until they are BARELY done (about 8-9 minutes). They'll absorb some of the sauce liquid, so you want to make sure they still have a little texture to them. Rinse them REALLY REALLY well with cold water (or else they will stick together). 4. 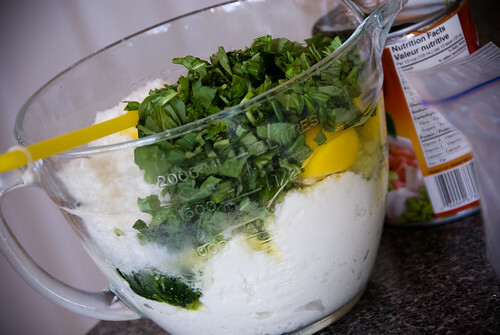 In a medium bowl, mix together the ricotta, spinach, basil, parmesan, egg and salt. 5. To assemble the lasagna, start with 1 cup of the meat sauce on the bottom of the 9x13 pan. Top with 4 lasagna noodles. Spread 1/3 of the remaining sauce over the noodles. Top with 4 more noodles. Add 1/3 of the sauce again, then add ALL of the ricotta spinach mixture. Top with 4 more noodles. Add the rest of the sauce and spread evenly. 6. Top it all off with the grated mozzarella. I like to grate a little more parmesan on top of mine too. 7. Spray some oil on a piece of foil and cover your lasagna. Bake at 375F for 35 minutes. Uncover and bake an additional 15 minutes. (I like to broil my lasagna for 2-3 minutes at the end so the cheese gets nice and brown). Let stand for about 10-15 minutes before serving (or it will be a soggy mess). I served this to a crowd varying from teens to not-so-teens, and it was met with universal approval. Dessert was SUPER simple. In fact, it was actually an afterthought. 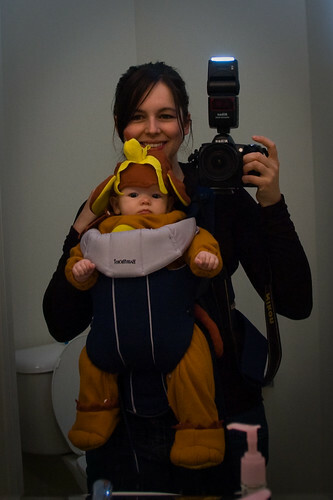 Lil Z was fussing like mad so I stuck her in the baby bjorn (similar to the picture below, but without the monkey suit, lol). 1. Peel and core apples. Chop them. Z seemed quite fascinated by this whole process. Dump them in a greased pan (I used a 9x13 because I like to have a thinner layer of apples). 2. Sprinkle craisins and blueberries over top. Squeeze the juice from the 1/2 lemon over top. 3. Combine the flour and the butter (I used a pastry blender). Stir in the oats, brown sugar, cinnamon and cardamom. Take about 1/3 c. of the mixture and combine it with the apples. 4. 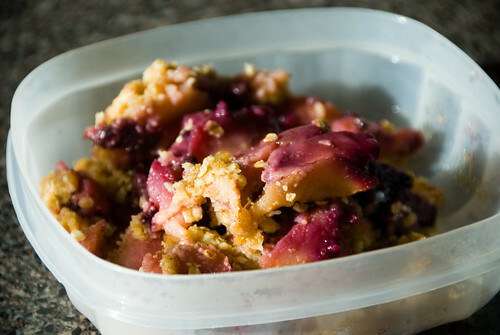 Dump the rest of the mixture on top and press into a sort of crust. Bake at 350F for about 40-45 minutes (until the apples are cooked). Yum. Very easy to put together, and odds are, if you have apples on hand, you can probably make an apple crisp. It's super forgiving too - you can change the ratios of things, add different spices...as long as there are apples and cinnamon involved...odds are that it will be yummy. The blueberries give it a nice purpley colour, so I always like to add them...they aren't necessary though. I love lasagna! 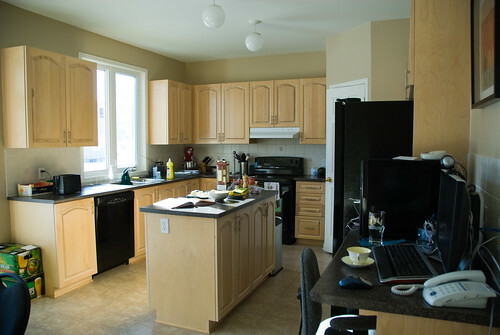 Looks like you will be having fun in your new kitchen! next time i make lasagna i think i will use sausage in it. everyone is always raving about it. 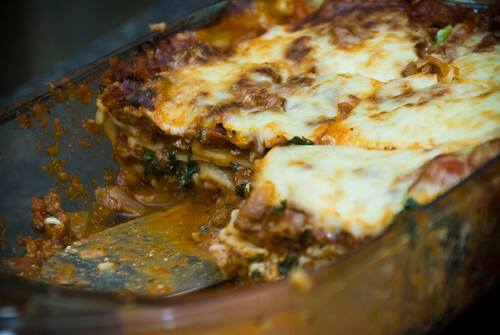 I made this recipe a few weeks ago, I've never made lasagna before and it was AMAZING!